Members of the American Legion Post 25 joined the Fayette County Commissioners as the commissioners signed a proclamation. The proclamation detailed portions of history for the Paul H. Hughey American Legion Post and commended the post for its 100 years of service to veterans, and encouraged the community to also commend the post. Pictured (L to R): Fayette County Commissioner Dan Dean, American Legion Post 25 and Fayette County Honor Guard member Glenn Rankin, American Legion Post 25 and Fayette County Honor Guard member Dave Frederick, Fayette County Commissioner Tony Anderson, American Legion Post 25 and Fayette County Honor Guard member Paul Sands and Fayette County Commissioner Jim Garland. 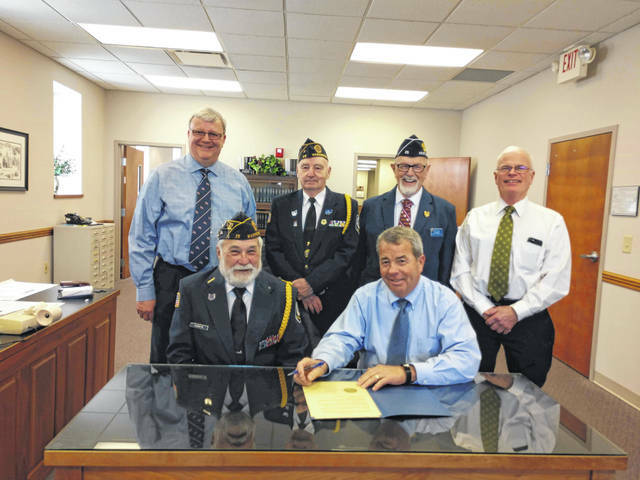 https://www.recordherald.com/wp-content/uploads/sites/27/2019/03/web1_received_309018866456639.jpegMembers of the American Legion Post 25 joined the Fayette County Commissioners as the commissioners signed a proclamation. The proclamation detailed portions of history for the Paul H. Hughey American Legion Post and commended the post for its 100 years of service to veterans, and encouraged the community to also commend the post. Pictured (L to R): Fayette County Commissioner Dan Dean, American Legion Post 25 and Fayette County Honor Guard member Glenn Rankin, American Legion Post 25 and Fayette County Honor Guard member Dave Frederick, Fayette County Commissioner Tony Anderson, American Legion Post 25 and Fayette County Honor Guard member Paul Sands and Fayette County Commissioner Jim Garland.